Perspective. 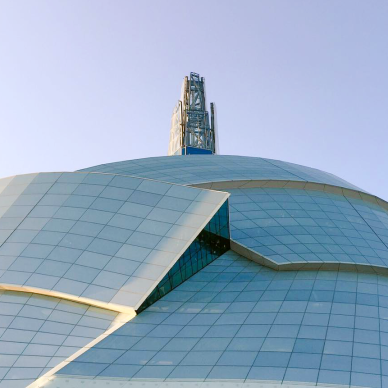 A photo can be taken from many angles at the Canadian Museum for Human Rights, each yielding a unique point of view. From directly below, the building appears warped, curving like a bowl toward our prairie sky. From afar, a lantern – a beacon of hope, if you will. The Mikinak-Keya tour offers an entirely different perspective, rooted deep in Indigenous spirituality and symbolism. Seven elders, known as the Elders Circle Seven, offered their perspectives on rights and responsibilities to the museum. Drawing from the seven sacred teachings, the Elders Circle Seven, along with Canadian Museum for Human Rights staff and architectural historian Frank Albo of The Hermetic Code Tour, created a memorable experience that connects the building’s unique design with traditional teachings of the Cree, Anishinaabe and Dakota peoples. By day, the Canadian Museum for Human Rights buzzes with exploration; children scurry after guides and adults roam from gallery to gallery. Before opening and after closing hours, the Museum falls silent as the Spirit Tour begins. We were greeted by Julie White, Carla Cochrane, Ali Fontaine and Sylvia Dueck, who said hello in different Indigenous languages and performed a traditional song. A theme was forming. 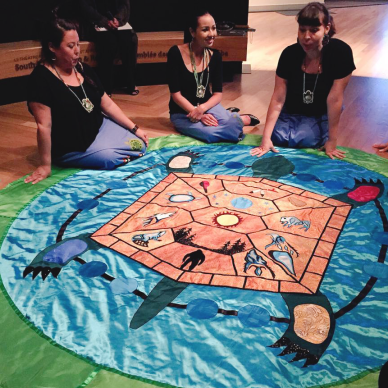 Four women were to take us through the museum and introduce us to the seven sacred teachings. We learned quickly that four and seven are significant numbers in ancestral teachings, and would follow us through our Mikinak-Keya journey. Over 400,000 artifacts were discovered in an archaeological dig conducted on the Canadian Museum for Human Rights site. While over half of these were animal bones, one set of artifacts stood out. A buffalo skull was found along with a pipe that bore a beaver image – objects that Elders believe were not found by mere coincidence. It is in these two animals where we find sacred teachings. The beaver teaches wisdom. In order to attain true wisdom, we must recognize our gifts and use them accordingly. Much like a beaver’s teeth, if we do not use our gifts, they will become useless. The beaver’s wisdom symbolizes having the wisdom to look inwardly at what we can contribute to society, and follow through. The buffalo represents respect. By giving itself for sustenance, the buffalo encompasses respect by showing it for others. Aboriginal people recognized the respect of the buffalo and showed it in return, using every part of the animal in order to thrive and live. 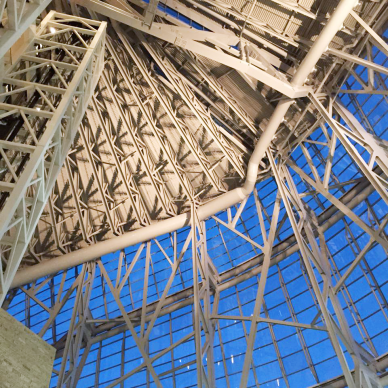 The massive body of the Canadian Museum for Human Rights is connected to the ground via four roots, spanning out like fingers or, as the Elder Circle Seven see it, a wolf paw. This distinct shape represents another of the seven sacred teachings; the wolf. When a wolf approaches another wolf, it bows in mutual respect. It shows humility. In the context of human rights, the wolf represents the first stage to equality. Humanity cannot be equal without humility and lack of arrogance. Upon entering the Indigenous Perspectives gallery, our guides urged us to pay close attention to our footsteps. This section of the Museum is different from the rest, in that it is the only gallery that has wood flooring. The Elders Circle Seven stressed the importance of this; and the Aboriginal perspective that human rights means interconnection of all living things, rooted firmly to the earth. It was here that we started our lesson on two more of the seven sacred teachings. The Sabe was a giant creature who the teachings say once roamed the earth. The Sabe also represents the most difficult teaching to master; honesty. Honesty means recognizing who one is in their culture, life and ancestry line. One of our guides remarked that perhaps the Sabe represents honesty because he knows who he is, and does not need his existence to be confirmed or proven by others. 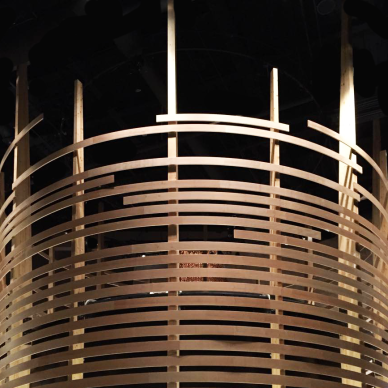 In the circular theatre, we looked at the turtle as a representation of truth. 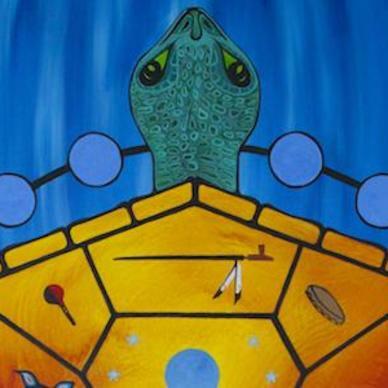 The shell of the turtle confirms truth, laying out a number of symbols right on its back. This lesson is simple and visible to all who look at the turtle – things are the way they are. The next step was to walk along the trail of the turtle, the ramps which offer stunning imagery to the interior of the Museum. The trail of the turtle represents past, present and future – it is not straight, and there are many turns along the way. As we walked along the ramps, we were encouraged to think about each teaching we had learned about thus far and reflect on how we could embrace them into our lives. The last stop on the tour was the Tower of Hope. 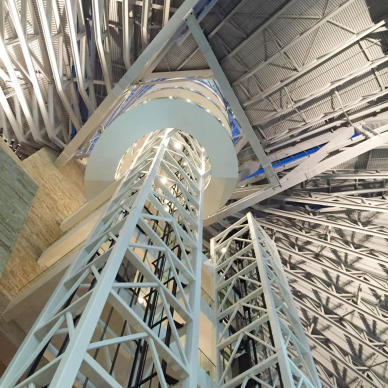 The tower shoots straight up through an enormous canopy of infrastructure and beams resembling a canopy of trees; a structure that can also represent the canopy of life. Once human beings can gather together underneath it, the circle will begin again and equality will be possible. The Tower of Hope is the home of the eagle – the seven sacred teaching symbol of love. In Cree, there is no word for hope. The closest phrase would be “An eagle is always present during ceremony.” The eagle’s teaching is crucial for human rights – unless you love your inner self, you cannot love others. It was up in the tower, looking over the darkening city that we learned of our last seven sacred teaching – the bear. The bear is represented in the stars and is the symbol for courage. Courage means the ability to have vision in order to face fear or changes. It is deeply entwined with every other seven sacred teachings. Without courage, we could not live our life with truth, honesty, or love.